A compilation of a great jazz series in the Seattle area. After several years of SRO living room shows, Nich Anderson decided to kick the program up a notch and invite his guest vocalists into the studio. 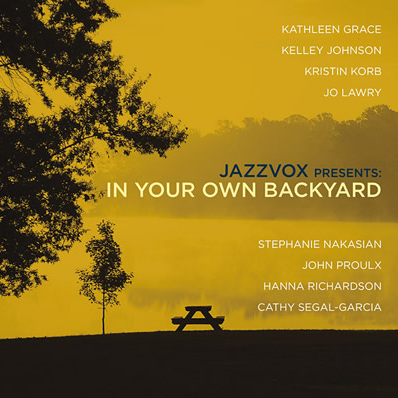 The result, released earlier this year on the OA2 label, is In Your Own Backyard, the debut JazzVox CD. The nine sessions that shape the album, all recorded and mixed by David Lange, commenced in August 2009 with Cathy Segal-Garcia laying down a single track — her own composition “The Cat,” co-written with Gary Hoffman — with Stowell. Seven more sessions followed sporadically over the next nine months, featuring a top-drawer assortment of singers, including Kathleen Grace, Kristin Korb, Kelley Johnson, Jo Lawry, Stephanie Nakasian, Hanna Richardson and the sole male among all the canaries, John Proulx.